Home :: Mikrotik Desktop Routers :: Mikrotik RouterBoard RB/493AH RB493AH complete 9 port 10/100 layer 3 switch and/or router assembled with case and power supply - New! Mikrotik RouterBoard RB/493AH RB493AH complete 9 port 10/100 layer 3 switch and/or router assembled with case and power supply - New! This assembled Mikrotik Routerboard 493AH comes complete with case and power supply and makes a fantastic 9 port 10/100 layer 3 switch and/or router. Fully managed with SPI firewall and vpn support. All ethernet ports are fully independent and support 802.1q vlans, and advanced routing protocols including RIPv2 and OSPF. Management from GUI or CLI with access through web, telnet, or ssh. This powerful Linux based device makes an excellent switch/router/firewall device for a SOHO environment. The RB/493 is capable of routing 16250 pps (1500 byte packets). Includes a switching DC power supply. Can also be powered on eth1 by passive POE from 10 to 28 vdc. 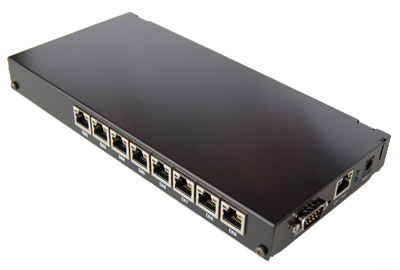 This RouterBoard is also available in a rack mount case. Optional radio cards and antennas can be added under the "Options" section. A, B, and C refer to the RouterBoard miniPCI slots starting with top, then middle, then bottom. Please be aware that MMCX pigtail cables are used with the R5H, XR2, and XR5 radio cards. U.fl pigtail cables are used with the swivel antenna and the other radio cards. See the radio card specifications if you are not sure what this means.